DALLAS (AP) — Luka Doncic has drawn plenty of comparisons to LeBron James during a sensational rookie season for the Dallas Mavericks. If the 20-year-old Slovenian passes up a potential winning shot in a playoff race one of these days the same way he did in a late-season matchup of also-rans, Doncic will be tied to James in a way he might not like as much. Doncic deferred to Jalen Brunson on a 3-pointer that the fellow rookie missed at the buzzer after Andrew Wiggins hit a go-ahead layup for the Minnesota, and the Timberwolves turned away a fourth-quarter Dallas rally in a 110-108 victory over the Mavericks on Wednesday night. While he shot just 23% from long range in March and was cold again in his first April game, Doncic had given the Mavericks one of their late leads with the same step-back 3 that has drawn comparisons to reigning MVP James Harden. But with the clock at 1.1 seconds and Doncic in position for another step-back attempt above the key, he slipped a pass to Brunson on the left wing. If the shot from the two-time NCAA champion from Villanova had gone in, it would have required a replay to see if Brunson got it off in time. Earlier in his career, James was occasionally criticized for passing up shots late in games. Karl-Anthony Towns had 28 points and 13 rebounds as the Timberwolves won for the third time in 11 games and avoided a three-game season sweep by Dallas, which trailed by 12 early in the fourth. Wiggins scored 19 points, including a tiebreaking layup on an assist from Josh Okogie with 19 seconds remaining. On the final play, Doncic created separation on Okogie to set up for the step-back try, while Tyus Jones came off Brunson to run at Doncic, prompting the pass. Dwight Powell finished a point off his career high with 25 for Dallas. Dirk Nowitzki, who has just two home games remaining in what is expected to be the 40-year-old’s final season, scored nine points. 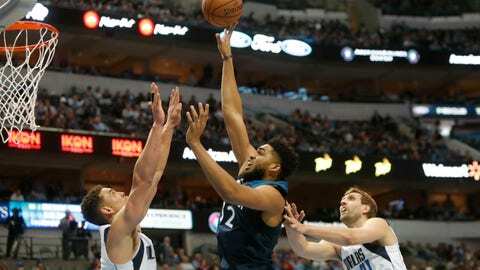 The Mavericks were coming off their first two-game winning streak since early February. Nowitzki scored his first seven points in the first 3½ minutes of the second quarter after joining a presentation from Dallas County officials, who a day earlier declared April the “month of Dirk” while honoring him for recently passing Wilt Chamberlain for sixth on the career scoring list. Timberwolves: Jones scored 15, and Dario Saric added 14. … Wiggins had a game-high seven assists. … The assist on Wiggins’ go-ahead basket was the only one of the game for Okogie. Mavericks: F Dorian Finney-Smith sat with a cut on his mouth. He was the only player to appear in all 77 Dallas games coming in. … Brunson scored seven of his nine points in the fourth quarter, but had his 15-game streak of double-digit scoring stopped. … After making two 3s in a game for the first time in his career in a win over Philadelphia, 7-foot-2 center Salah Mejri missed all four from long range but made all five from inside the arc and scored 11 points. Doncic was 2 of 8 from 3 is shooting 23 percent from beyond the arc since March 1. But he wasn’t the only cold Dallas shooter. Nowitzki, playing a record 21st season with the same franchise, was 1 of 8 as the Mavericks shot 18% (7 of 39) from beyond the arc. Timberwolves: Miami at home Friday. Mavericks: Memphis at home Friday.